Hi everyone! 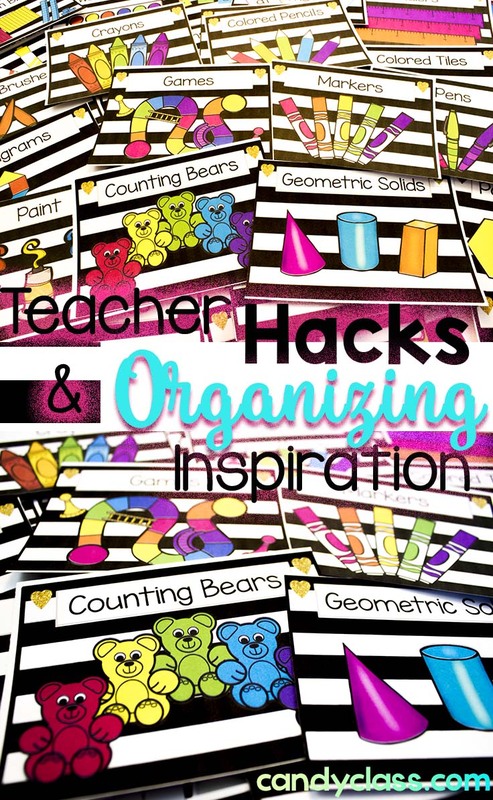 I wanted to share some organizing inspiration and teacher hacks! Contrary to what the clear tape people told you, student name plates do not need to be a permanent fixture on a desk. Use some mounting putty and plop those babies on the desk. Little Talks-a-lot not mashing well with the Chatsome Talkettes? You can relocate that student swiftly without a word while you waltz the room teaching that math lesson. 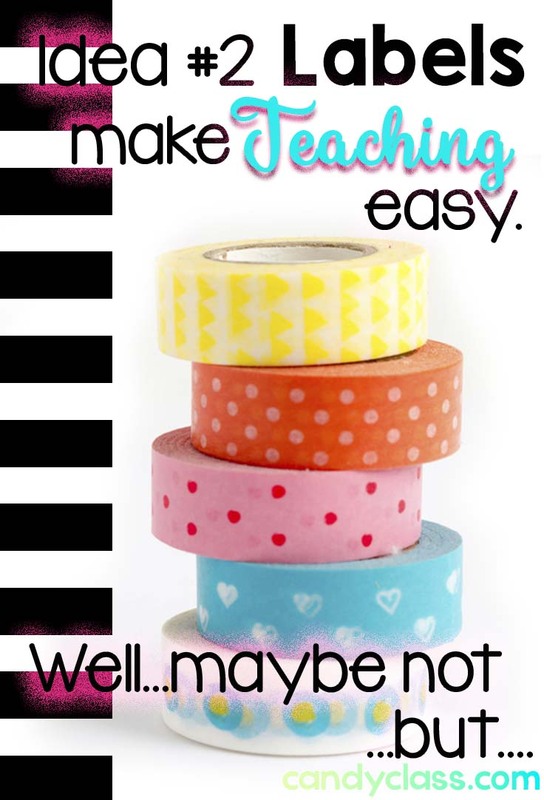 Labels make teaching easy. Well, maybe not, lol! 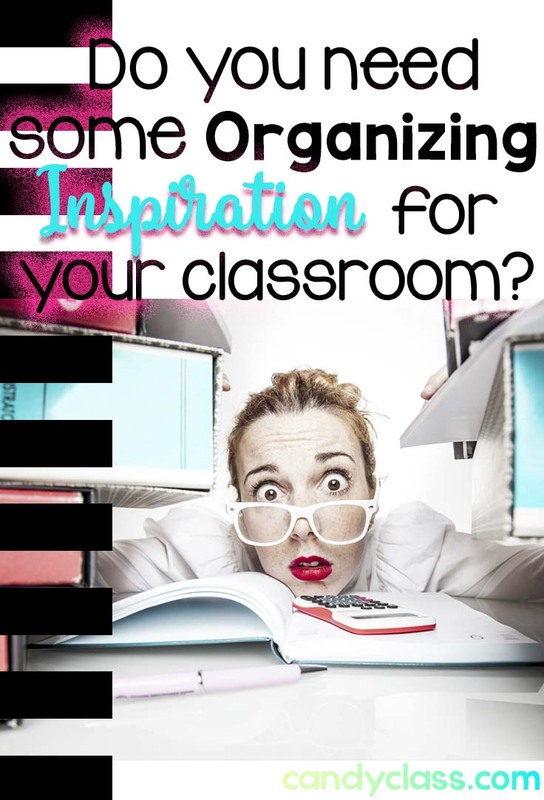 They can’t take away the stress of unscheduled meetings, interrupted planning time, and that student who you love so dearly (ahem…after they move on to the next grade level). But labels do help label away the stress of chaotic basket mash potatoes, so label, label, label. 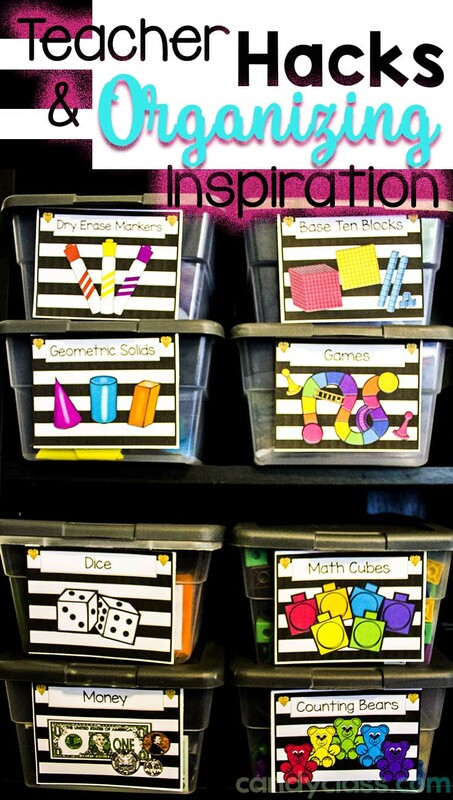 Tip: Simple shoe box containers with lids are really great for storing all those math manipulatives because you can stack them easily on a cheap $20 book shelf. I use the additional space on the side of these containers to stack some plastic pencil cases for things like flash cards. No more looking like you are running the airport. Use center signs to smooth out transitions. Teacher Hack: Use place holder signs for placing the center signs in their place. Super simple and cheap. I snagged up a box with 8 of these place holders for under $5 with a 40% coupon from a craft store. 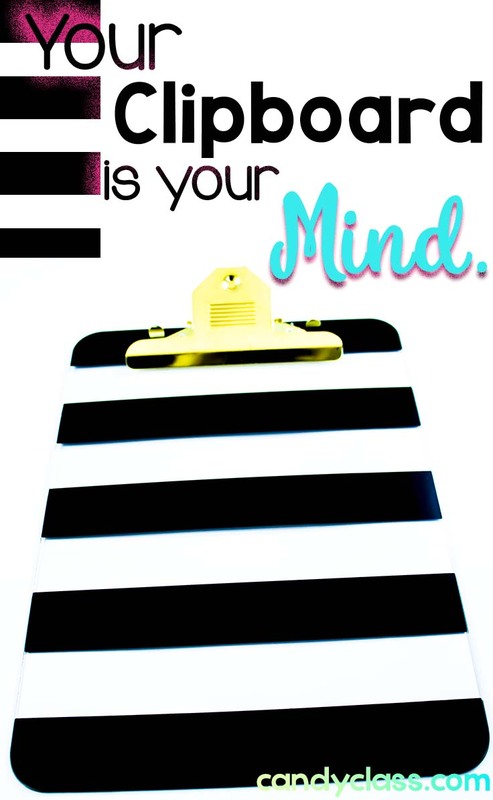 Your clipboard is your mind. (Ok, now that I am rereading that statement…I am realizing that totally sounds zombie like. Your clipboard is your mind. And I don’t even watch horror movies, lol!) With all due seriousness, my biggest weakness is my memory. It’s not that I forget things. It’s just I don’t think about them at the right time…like the next day I remember. See I remembered. 🙂 I remembered that one student was suppose to go in the car rider line instead of on the bus to after school care…after I put him on the bus (and the parent came in looking for him…but they helped me remember!) I remember that meeting with the superintendent, the next week (after they hand me a pink slip…ok pulling your leg on that one, lol!) But, I do forget way too much! But those things are not forgotten anymore because I realized a long time ago that my clipboard is an extension to my brain. On my clipboard, I have kept a list of transportation that lists every day of the week for the month. 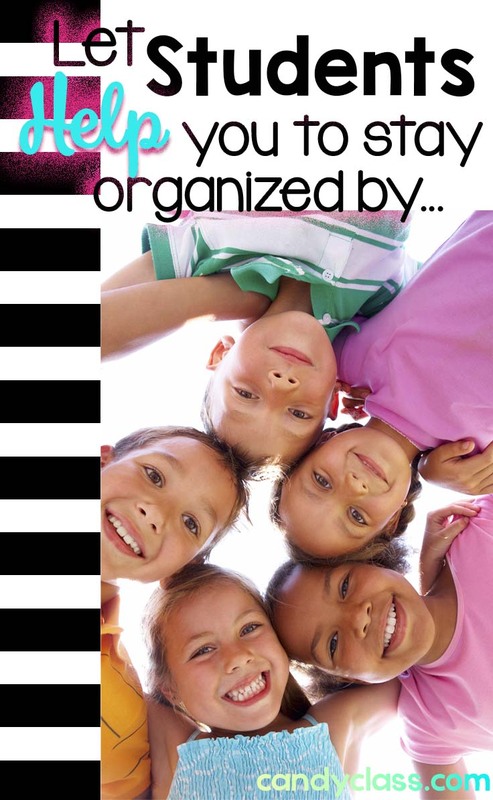 Than, simply check off each student as they line up to make sure everyone is going to the right place on the right day. A to-do list is a clipboard must. A schedule with student rotations comes in handy. 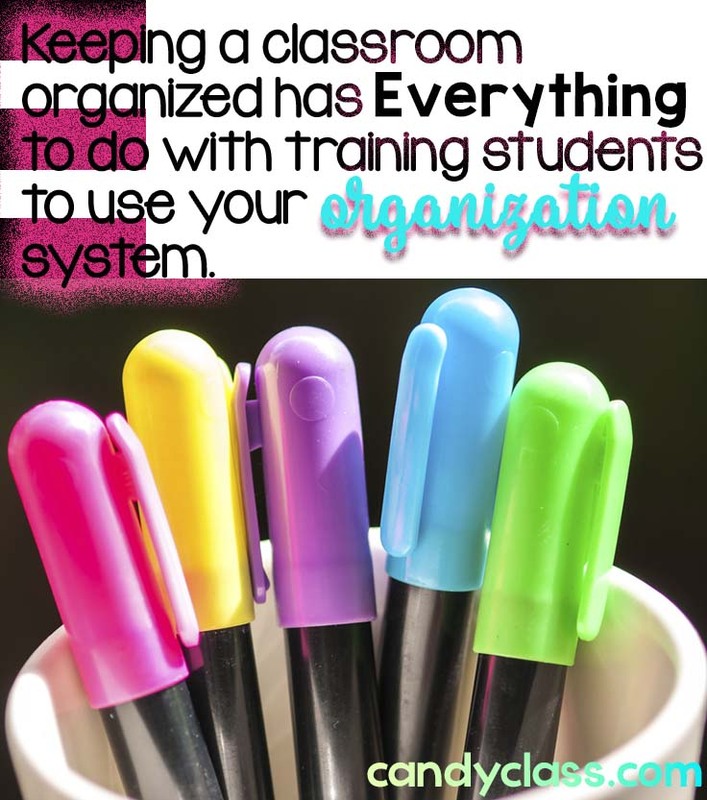 Keeping a form for classroom management helps too. With a clipboard doing the hard thinking, it takes away quite a bit of stress and helps even the most forgetful of people (me!) remember. An attendance list is also good to store there and comes in handy for any kind of drill. Keeping the clipboard either in my hands or an arm’s reach away has kept me on tract and well organized. 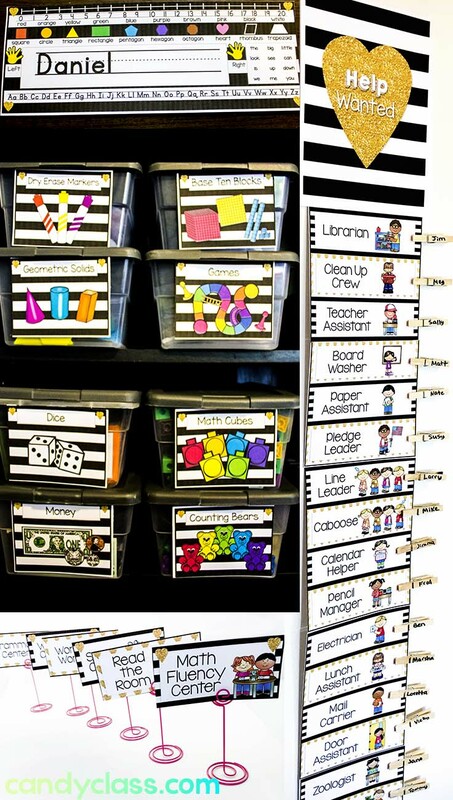 Let students help you stay organized and use signs to keep their classroom job roles organized. Students don’t suddenly become responsible adults one day, they grow into responsible adults. A classroom job is like the water that will help that growing happen. By the way to make them even more responsible, you can send them to clean up my house too….just saying ;). 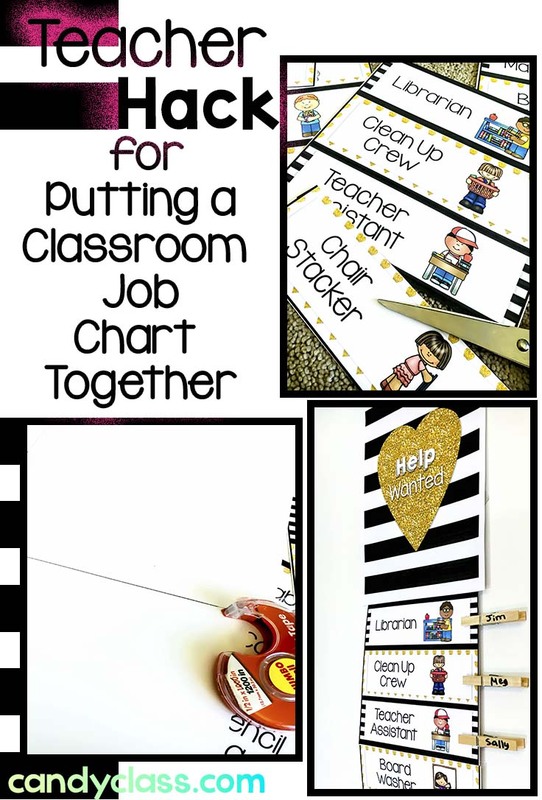 Use a classroom job chart with clips that rotate to make management of the jobs easier. You can even have a student rotate the clips for you. As I mentioned, students can move the clips for you. Simply have them remove the bottom clip and place at the top. Than move each clip down one. If there is a job that has more than one student, you can put a sticker dot or mark a dot for each of those spots on the job chart. Students simply put the clips on those dots. Eliminate some of the cutting, by only clipping the jobs you won’t be using from the pages. Keep the rest of the page together. No need to cut it all. Less cutting will also make it more durable and easier to piece it together. However, maybe you don’t need a chair stacker…so clip that one off the page. Then attach the rest of them together with tape on the back. 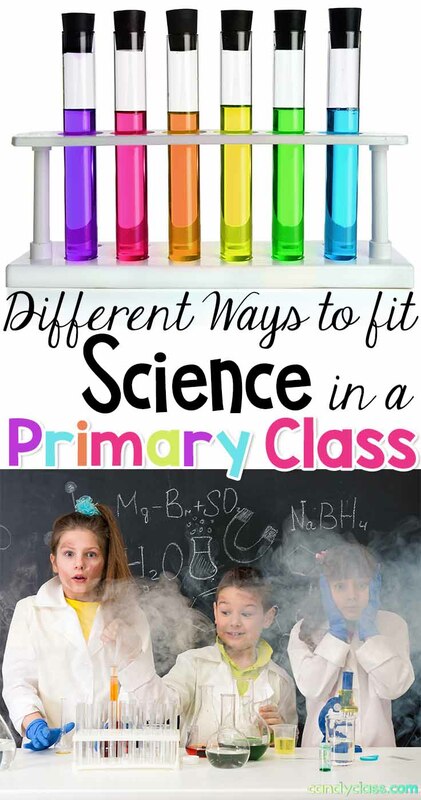 Laminate them either all together (if using a school laminator) or in paper size sections (home laminator). 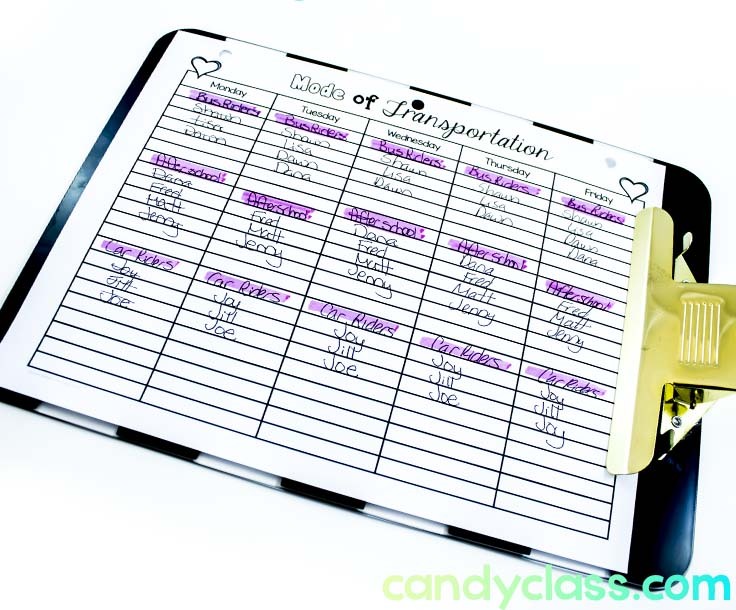 If you laminated in paper size sections, attach them all together with a stronger tape like duck tape on the back. You want the back to have good support to hold it all together. Attach the top part securely to wherever you will be attaching it, but allow the rest to float down. 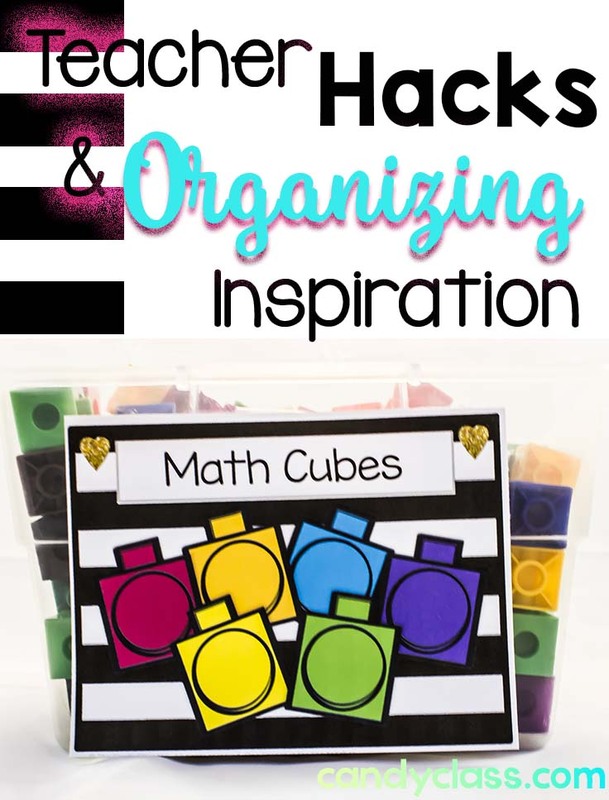 Click here to get to the organizers and decor. 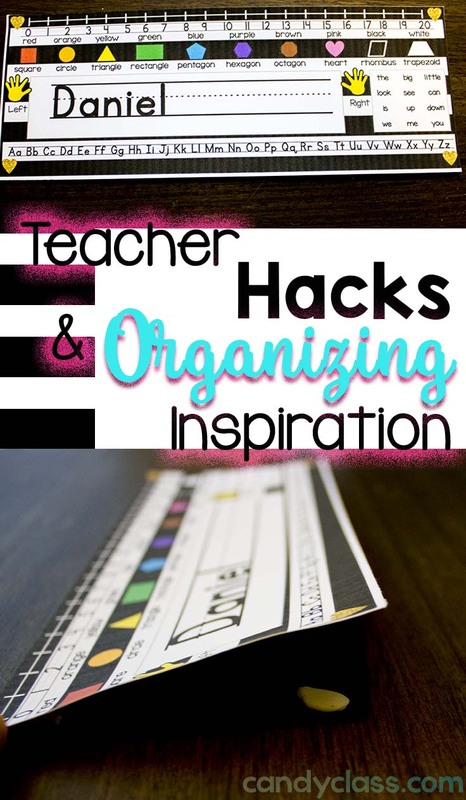 I hope you found some helpful ideas with the teacher hacks mentioned and some inspiration. Make sure to subscribe to my email to receive more inspiration and ideas in your inbox. Thanks so much for stopping by the Candy Class! Grab the task cards for free when you subscribe to the newsletter! 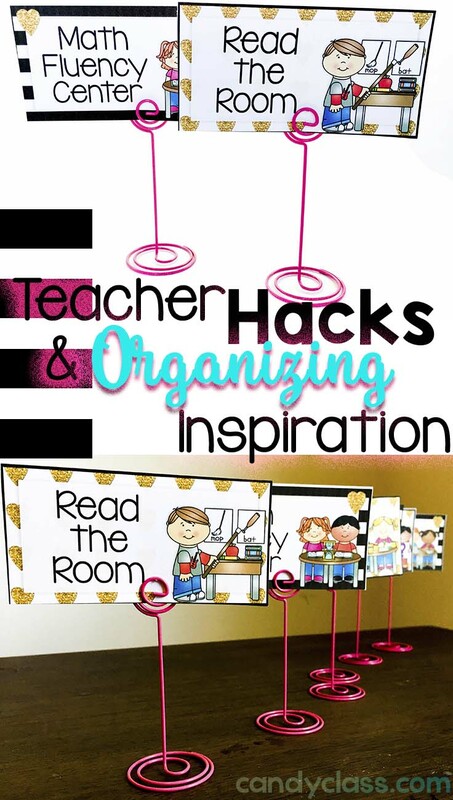 Then get inspired, find teaching ideas, receive exclusive freebies along the way, find out about secret sales, learn about new resources, and more through the newsletter! Excellent! Please check your email to confirm your subscription and to grab your freebie. Thanks for joining us! 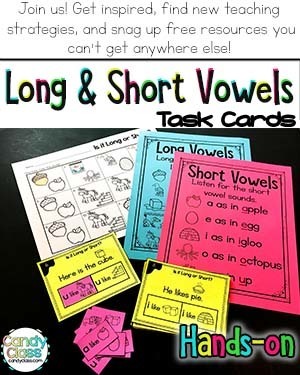 Engaging Alphabet Activities, Ideas & a Free Alphabet Flip Book! I simply loved it! Awesome!